← The Future of the Aquarium Trade: What Will YOU Do? Another paper showed that large artificial reefs can support diverse and abundant coral and fish communities at higher percentage coral cover than nearby natural coral reefs in Dubai. 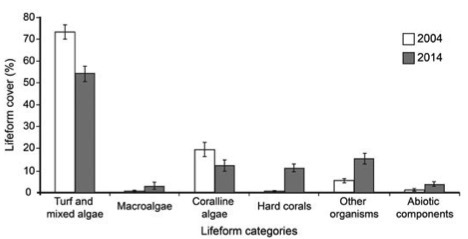 However, artificial reefs had lower coral diversity, which highlights the need to conserve natural coral reefs instead of replacing them entirely with artificial reefs.5 The high coral cover does provide an opportunity, however, to grow coral for transplantation later, or as hubs of reproduction. Artificial reefs are undoubtedly only local solutions with low efficacy on a global scale, but they provide one positive solution when done correctly. Artificial reefs will never be able to fully replace coral reefs, as such a project would be far too expensive, disruptive, and the species diversity may never reach natural levels. However, they provide hope as they can be used as places for fish species to take refuge as corals continue to die off, and once coral species on these artificial reefs reach sexual maturity, they can contribute to the growth of natural reefs as well. Lastly, I want to provide tips on how to contribute to coral reef conservation as an individual. If you want to get involved in reef conservation, look for local groups promoting beach cleanups or educational events near you, stay informed on upcoming legislation and what your candidates for local government stand for. Keep an eye out for algae and beach cleanups in your area, and try to eat sustainably sourced fish. And of course, reducing your CO2 consumption and overall living an environmentally friendly life will benefit the ocean as well as various other ecosystems. 8 We can’t all spend millions of dollars to sink giant ships or designate large swaths of ocean as Marine Protected Areas, but we can still try to make a positive human impact on our oceans. Ekstein, Nikki. “Richard Branson’s Latest Travel Project Is Underwater.” Bloomberg, April 7, 2017. https://www.bloomberg.com/news/articles/2017-04-07/richard-branson-opens-b-v-i-art-reef-scuba-dive-site. National Ocean Service. “What Is an Artificial Reef?” Ocean Facts, January 23, 2014. “A Brief History of Marine Artificial Reef Development in U.S. Waters.” Powerpoint presented at the NOAA/ASMFC Artificial Reef Workshop, Alexandria, VA, June 9, 2016. Ng, Chin Soon Lionel, Tai Chong Toh, and Loke Ming Chou. “Artificial Reefs as a Reef Restoration Strategy in Sediment-Affected Environments: Insights from Long-Term Monitoring.” Aquatic Conservation: Marine and Freshwater Ecosystems, January 1, 2017, n/a-n/a. doi:10.1002/aqc.2755. Burt, J., A. Bartholomew, P. Usseglio, A. Bauman, and P. F. Sale. “Are Artificial Reefs Surrogates of Natural Habitats for Corals and Fish in Dubai, United Arab Emirates?” Coral Reefs 28, no. 3 (2009): 663–75. doi:10.1007/s00338-009-0500-1. Harrigan, Stephen. “Relics to Reefs: Why Fish Can’t Resist Sunken Ships, Tanks, and Subway Cars.” National Geographic, February 2011. http://ngm.nationalgeographic.com/2011/02/artificial-reefs/harrigan-text. Sheppard, Charles R. C., Davey, and Graham M. Pilling. “Restoration of Reefs.” In The Biology of Coral Reefs, 297–99. Oxford: Oxford University Press, 2012. Correa, Adrienne S. “Reef Solutions” Coral Reef Ecosystems, 13 April 2017, Rice University, Houston TX. Class Lecture. This entry was posted in Uncategorized and tagged 2017, artificial reefs, Monica, positive anthropogenic effects, positive human effects, reef solutions. Bookmark the permalink.